EHMS will host the sixth annual open longsword competition on the 18th and 19th of January 2019. This year we will be hosting a total of four competitions. Open Longsword, Women’s Longsword, Cutting and Singlestick. We will also have a Triathlon which combines Longsword, Cutting and Singlestick tournaments. Singlestick is capped at 32 participants, the other tournaments do not have a participant cap at the moment. You will automatically take part in the Triathlon if you register for Singlestick, Cutting and at least one of the Longsword tournaments (women can take part in both). If you take part in both of the Longsword tournaments, only your higher placement will count towards your Triathlon placement. Please read through the rules carefully. All weapons will be provided by the tournament. Please read through the equipment requirements. The main event will take place on Saturday the 19th at Ruskeasuon urheiluhalli, Ratsastie 10. On Friday the 18th we will hold Singlestick pools and eliminations at EHMS’s salle in Sörnäinen, Suvilahdenkatu 10. Singlestick finals will be held at the main venue on Saturday. On Friday the doors will open at 17:00 and the gear check starts at 17:30. The singlestick pools will end at the latest at 22:00. On Saturday the doors will open at 08:00 and the gear check for the first pools will start at 08:45. The awards ceremony will end at the latest at 22:00. A more detailed schedule will be provided at a later date. The Singlestick tournament will be held at the EHMS salle on Friday. The address is Suvilahdenkatu 10, 00500, Helsinki, and you can reach it by multiple buses and subway from the city center. There is limited parking near the salle. On Saturday, the main tournament will take place at Ruskeasuon liikuntapuisto. This is the same venue that has hosted the Helsinki Longsword Open the past two years. The address is Ratsastie 10, 00280 Helsinki. 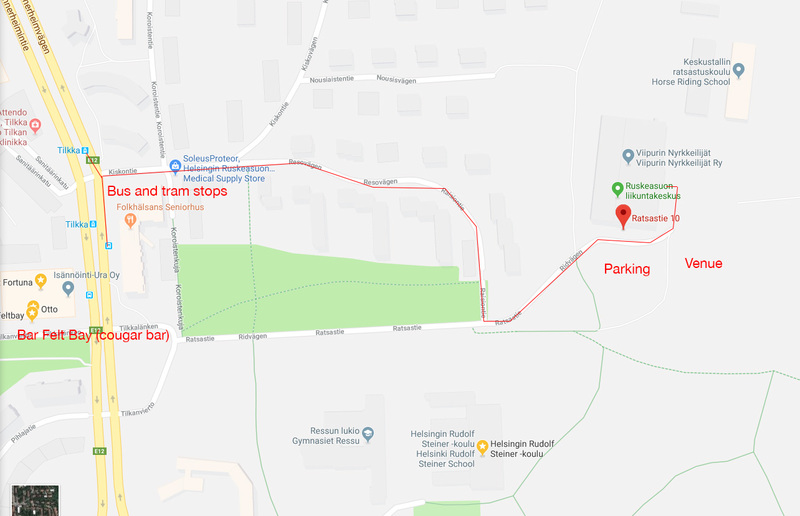 The venue can be reached by several bus lines (bus stop Tilkka) and the tram line 10. There is plenty of parking available. Parking is free, but restricted to 4 hours. EHMS will not provide insurance for the event. We highly recommend getting a sports insurance that covers full contact martial arts in a competition setting. Note that Finland does not have a national HEMA association, which is something some insurers may ask about. There will be first aid staff on site during the event. You can contact the organisers by email at events@ehms.fi or through the Facebook event page. Please register using the form at the bottom of this page! Note that women can compete in both the Women’s and the Open Longsword tournament. We will send bills per email based on your registration. You can pay the bill using bank transfer, or through Paypal. The registration will not be considered confirmed until payment has been received! The bill will have a due date 14 days from the date it is sent. The bills will be sent in batches, so don’t worry if you don’t receive yours right away. Note that if you neglect to pay the bill within a month of issue, you will be dropped from the roster. Please contact us if you have questions regarding billing. We will not issue refunds after 31.12.2018 without a good reason! Questions? Contact us at events@ehms.fi or post a question on the Facebook event page. Please view the data privacy statement in English or in Finnish.